The first destination on our annual fall pilgrimage, initiated on our honeymoon 32 Octobers ago, was Ohio University (OU) to visit our freshman. The plan is to bookend a swing through eastern Ohio with visits to our student-daughters in Athens and Kent. For most of the decade of autumns before we had children, we traveled to Vermont, New Hampshire and Maine, exchanging Maine for the Adirondacks just about every foliage season. It was magnificent: ambling the golden-leaf strewn pathway to Robert Frost’s cabin in Ripton, Vt.; cutting over Breadloaf mountain where the yellow, Victorian buildings of Middlebury College’s writing mecca glowed against the robust red maples; scarecrows blowing chilly breath into Brandon at every intersection long before it was a thing; paddling the color-drenched shores of Blue Mountain Lake at the Hedges, an Adirondack “camp,” built by Vanderbuilt’s Sagamore Lodge employees; a warm bowl of seafood cioppino quenched with a cold Long Trail ale at White Dog Tavern at the end of a day of leaf peeping. Two years ago, on our anniversary, we trekked to Dublin, Doolin and Galway in Ireland, touring the Aran Islands after a ferocious ferry crossing. I relished a rather mundane experience: purchasing eyeglasses. On a whim, after finding nothing at home, I packed my prescription. No high-pressure sales, just a very knowledgeable attendant, who actually drew my eye, explaining my need for thicker lenses. Ten days of Guinness, Celtic music and Irish hospitality were a delight. Last year, we ventured to Cape Breton, leaving a charming but cold fishing shack when temperatures dipped and accidentally texting a stranger, who, nevertheless, offered us a warm bed. We rented an artist’s handmade home in the country and concluded with an exhilarating day in Halifax among markets and breweries. Maudie* country is stunning. This year’s trek is closer to home, revolving around our oldest’s 21st birthday. She actually asked us to take her to a bar – how could we refuse? On the first leg of the six-day journey, we make a quick stop in Jackson to a funky fabric-garden-Christian-snack outlet (Guhl’s Country Store, where my fashion-design student saves big bucks on bolts of muslin). When I tell the cashier we were headed to OU, she responds that her grandson’s a sophomore and they’d had 14 rapes reported. This was not good news. I googl local police reports and the Columbus Dispatch to discover it’s now 16. Inexcusable. I can not wait to hug my daughter. We reach her 45 minutes later, unload the fresh mini pumpkin pies I’d baked, her winter coat and boots. She is deliciously happy as we whisk her off to lunch at the worker-owned Casa Nueva, an Athens staple. It’s not somewhere she could afford on a student budget (although with a meal plan at $23 per day for 2 meals, she could). I order the seasonal corn enchilada with Ohio cheddar, roasted red peppers and pulled pork, only I get dry chicken, baked in verde salsa. Before real Mexican street tacos at one-tenth the price spoiled me, I would have been satisfied. They are fine for American tacos. And the ambiance is old-school granola on the restaurant side. It is a great place to catch up with our emerging adult. After what seems like too-brief a visit, we are back on route 50 headed toward Marietta. We live near 50, but have never traversed this segment. We experience a hauntingly beautiful drive on this steamy, sometimes rainy afternoon. I had hoped to catch a glimpse of Blennerhasset Island, where Araon Burr hatched his foiled coup, but the turn toward Marietta intervened. The Blennerhassets created the American dream, immigrating from Ireland, thriving and leaving behind a stately mansion, now the hub of a West Virginia State Park. You arrive via paddleboat from Parkersburg, W. Va. I almost miss the drive into town trying to book my next adventure, a BIG one for a BIG birthday, on my phone. The town is village-like until we cross the Muskingham and into the heart of Marietta. The downtown sweeps broad like a frontier with brick former banks, warehouses and theaters abutting feed mills, eclectic shops, restaurants and bars. We spot our hotel, one of the last river accommodations I note somewhere, bending around a corner opposite the Ohio River. I am surprised by its authenticity, as if nothing’s touched. When we check in, I ask if we can have a river view. I am firmly told no, because I booked on Expedia. “Can’t you push that?” I ask. “No.” Her voice has the familiarity of my attempt to book direct. She wouldn’t budge then, either. So the Expedia room it is. Between the second and third floors, the elaborate staircase vanishes, replaced bya utilitarian set (think Upstair/Downstairs or Downton Abby). So does the air conditioning. Hit with an odor as we enter out floor, it dissipates in our very small room. You can’t open the door and access the bathroom at the same time. This is the charm of another era when we lived within our means and did not seek sprawling spaces. It’s fine for two nights, except getting there through the horribly smelly hallway I realize is mold and mildew. Later I check deeper into reviews that universally report the smell of fish. That smell is confirmed at the front desk when I ask for a room that will not trigger a migraine. “Well, we’ve had lots of floods.” We move up a floor to an almost identical room with a less-pungent entry. It really is a cool, old hotel, echoing the southern charms of the river, sort of New Orleans meets Chicago. Victorian furniture you sink into (because seats have supported many a derriere) invites visitors to sit and merely watch the river. We settle in, then head out to explore. We walk the expanse of downtown, surprised by its size and vibrancy, although there are vacant buildings. One is advertised for free. People are friendly and I spy young adults, likely Marietta College students. The waterfront seems almost virginal, refreshingly undeveloped, lined only with a walkway. The humidity brews up a thirst we quench at the most-local bar we uncover, Town House. It’s trivia night with $3 Amstel Lights, cheapest I’ve ever found, and a homegrown-tomato-and-tuna/chicken/egg salad special. Who could resist? We trade history for empty dinner plates with the bartender, pay and head back, full and sleepy. I hear an owl, a rooster and traffic from my cozy, studio airbandb. I think those may be apt symbols for Texas, a wild and wooly place new to me. The owl represents nature; the rooster, a rural, village-like culture; and cars, progress as well as a way to get to the spread-out places. I tried like the dickens to do this trip without renting a car, but not meant to be. The guy at the rental-car counter, originally from Chicago, said: “No way, can you NOT have a car. I had a hard time when I moved here three years ago,” he said referencing the Windy City’s EL-subway. And I don’t mind a bit. Of course, I wanted the mother-daughter trip, but I doubt I would have tackled the hole-in-the wall taco stand [and flirted for a hot sec with the guy who wanted to buy my tacos and take me dancing] or a beer at a crazy bookstore called the Wild Detectives [we would have done coffee, but then I wouldn’t have had the privilege of sharing a beer with Jose, the bartender/barista from Peru]. And maybe not the local, Fiesta grocery catering to an Hispanic clientele or the school-uniform shop in the midst of an authentic and not-so spiffy enclave. The trip began with a 4:15 a.m. alarm and my diligent husband depositing me off at Frontier (ok, it’s CGV, so they all pretty much share the same drop-off and terminal these days). Took five minutes to check my bag and get through TSA pre-check, which I see as pretty much white privilege. Rarely do I spot anyone of color in those lines. It feels a bit segregated to me, but the cost of flying probably eliminates the have-nots. After walking past my gate hidden before the Subway, I stumbled into a friend, who has moved back to town. It was fun sharing an early-morning yawn. No time for a Starbucks as the place was packed and my other half had French-pressed me a decaf and had it ready in a go-cup. Yes, I know, he’s pretty special. It seemed I’d have a row to myself until the legions of Bengals’ and Browns’ fans began to board for the NFL draft (of which I know nothing, except what my seat mate explained). I silently chuckled as the 6’7” guy stuffed himself into the middle seat across from me. Luckily, Penny and her college-senior daughter, all of us under 5’5”, neatly fit and slept most of the trip. Before some shut eye, I did learn Penny is a longtime Bengals’ season ticket holder and was one of 32 NFL fans flown, wined and dined at last year’s draft. She won a similar honor this year. This six, burley twenty-something guys in the row ahead of us drank Bloody Marys. They weren’t obnoxious, merely entertaining. As much as our flight attendant, who mimed the whole safety spiel (including drowning and gagging from the oxygen) to much laughter and applause. I asked if she’d studied acting and she said she had attended a school for performing arts, her life had taken a different turn and she wanted to use her skills. The trip flew by. I whipped through DFW airport, was whisked aboard a shuttle to all car rentals – apparently they ran out of room, so all agencies are located in a new terminal just for cars about three miles away – collected my sporty Mazda and drove off to parts unknown, listening to my navigator. Until there was no guiding voice, so I pulled over to discover I couldn’t sync my phone with the vehicle’s Bluetooth. When my phone charged, there was no audio. This would not do for driving in a city foreign to me. Desperate, I simply unplugged the phone and got my audio back, hoping to have enough charge to get to Bishop Arts, just outside of downtown Dallas, near by accommodations. I was being charged $3 a day plus the amount of tolls on my rental, so opted for the actual “free” way, which may have been why it was so harrowing. So many switches, confusing construction and snaking roads. When I arrived, I parked next to an elementary school, exhausted and grateful … until I could not get the car to lock. I retrieved the quick-start manual, then the full manual to read up on “advanced” keyless entry, which left me clueless to how it doesn’t work, even though I’ve driven a keyless Prius for years. I called my husband, who smartly suggested looking at a Youtube video. No help, so I called roadside assistance, suggesting either I was missing something or the remote was malfunctioning. After a bit of stifled silence, the operator returned and said to move farther away from the car, lock it and leave my keys at that distance, then see if it locked. Voila. She said they get those panicked calls all of the time. Phew. Now I could get on with my trip. First order of the day, now midmorning, was to eat tacos. I walked toward a woman in front of a Mexican restaurant and asked her for a recommendation. 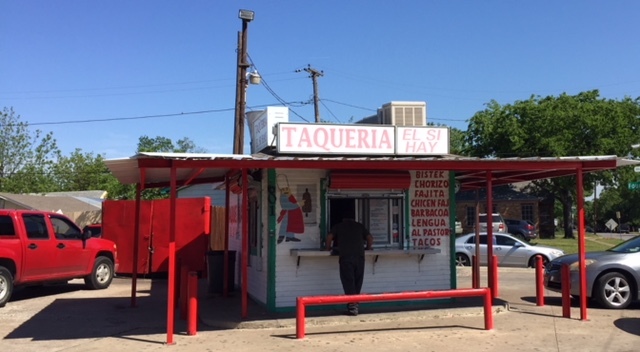 "Don't eat here, down that way," she pointed, to a taco stand, "Taqueria El Si Hay." With that advice I ambled down the street to a tiny walk-up joint surrounded by pick-up trucks. I asked the guy ahead of me what he was ordering. He said fajitas. I let the guy behind me go while I debated, then I ordered corn tacos with fajita (steak) and bistek (steak) because they were out of al pastor (pork). The person ahead said I'd made a good choice, but I think he would have said that no matter what. He very persistently tried to 1) buy my tacos 2) have lunch with me 3) invite me to go dancing among other things. He was amusing, not menacing. Even so, when I was able to disengage, I chose to walk a ways to find a quiet place to eat ... alone. My feast was pleasing, if a bit greasy, and topped off with a Mexican Coke. It really does taste better. I walked the arts district, peering into a t-shirt shop, then meeting Kristen in her lovely, artistically curated gift shop, all GOOD things. She drafted a list of her favorite places – she lives downtown and loves her city – around Dallas for me on beautiful embossed stationery. “My boyfriend and I are thinking of writing a guide because we get so many requests.” I got a sneak preview. I stopped in the electric bicycle shop to enquire about a rental, was lured into Lydia’s eclectic shop by the smell of patchouli and we traded stories about the helpfulness of CBD (hemp) oil. I think it was there I saw a t-shirt that read: “I love Jesus and I like to drink.” A bit edgy and sacrilegious, but VERY human. My daughter said it sounded very Texas, which was my impression. I eventually made my way to Wild Detectives for a restroom to wipe away the travel grime and order a coffee. Only I began conversing with Jose, the barista/bar tender and we shared local brews (his was half size since he was working). A transplant from Peru with a degree in philosophy and a local teacher-girlfriend, he imparted his local tourism knowledge, pushing the Kimball Art Museum in Ft. Worth. “You walk in and see the Old Masters and Picasso. No on believes Texas has that kind of culture, like New York.” Apparently, there’s an entire cultural corridor in Ft. Worth, more of Old Texas with this exception, Jose said. Another customer, visiting from Brazil, overheard and highly recommended not only the Kimball (designed by Louis Kahn), but the Amon Carter Museum designed by Philip Johnson and American Art and the Modern Art Museum of Ft. Worth, designed by Japanese architect Tadao Ando. He delighted in their exteriors as well as their collections and seemed to be an architecture geek. I still had time to kill before my rental was ready, so walked to a more authentically Hispanic, less gentrified, section of the area, as recommended by Jose. So many glamorous dresses filled little shops, tucked beside mini mercados stuffed with piñatas and auto-insurance and medicare/caid-assistance businesses. I stopped in a consignment shop because I always like to see what the local treasures are, and met a young woman from Guatamala, a preschool teacher with a very sick seven-year-old. A bright red, wingback rocker tempted me, except that I couldn’t imagine the hefty baggage fee Frontier would charge. I was mesmerized by Levine’s, an old-school department store, offering rack after rack of school and work uniforms and every sort of Levi style ever conceived. There was a platoon of navy blazers embroidered with school names. I asked the clerk if there were a lot of private schools. Charters, he corrected me. I ended my visit at Fiesta, the local, large grocery, perusing the exotic fishes, meat parts, stacks of tortillas and cactus leaves. I opted for store-made ceviche, guacamole, Amarillo tortillas, a small wedge of queso cotija, a six-pack of Estrella Jalisco, a handful of 10-cent limes and piece of flan. 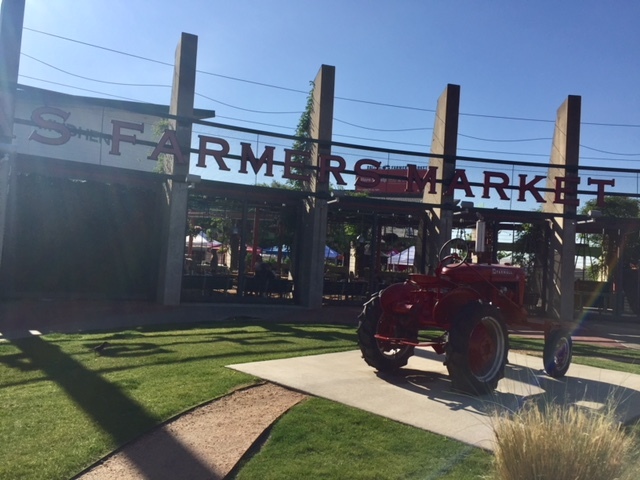 With an hour left to check-in, I drove by the home my childhood friend and her fiancé – their wedding is the REAL reason I am in Dallas – are building in the arts district. Workers installing the tile on the front porch motioned me inside when I asked for the groom-to-be and general contractor. My mouth was agape at how stunning this spacious, well-planned, heavily-detailed contemporary-but-classic home is. I waited for Carlos to finish a phone call. A friend of the groom, he graciously showed me the house, all of its nooks and crannies and secret storage. Some of the storage rooms are bigger than bedrooms in my house. Harry Potter would have a villa under these stairs. Intricate, hand-crafted wood floors, deep crown molding and custom cabinets made me drool. This is a to-die-for dream house. I swore Carlos to secrecy that I hadn’t been there because the wedding includes a chartered bus ride to see the home. I am so happy to learn more about my friend, Amy, a Texan for a long time, on her turf. I only see her when she returns to Cincinnati. Our parents became friends in college and lived in Chicago as young adults raising young families. They followed us to Cincinnati shortly after we were transplanted. We’re more family than friends. Because of life circumstance, I am the only one from my family available to make this trip. Amy and Stephen recently flew home to visit my sister and husband as he struggled with illness. That’s family and long-term friendship. I left this beautiful spot to head to my well-appointed, but much sparer studio to revive myself from the very long, but fruitful day. I opened a beer and lingered in the late-afternoon sun, feasted on my store-bought goodies, planned the next day, binged a bit on Netflix and retired to the sounds of the owl, rooster and traffic, which lulled me to sleep.